Raspberry and assam melody flavors are very rich and quite distinct, just like Merlin, himself. These, plus the cream flavor make for a very delicious and unique blend. Merlin, of the BBC show by the same name, is the most powerful warlock to have ever lived. He is quite cheeky when he&apos;s not being incredibly protective of Camelot and Arthur. 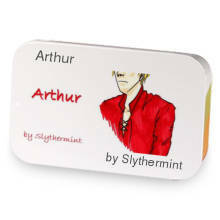 Merlin has hooked up with Arthur. Love Merlin? This is just one of 5 teas in this fandom. Check out the whole series.